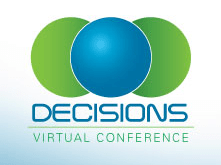 Decisions Spring 2011 – don’t miss it! The countdown has started–it’s less than a month left to Decisions Spring 2011, the fourth virtual conference by MSDynamicsWorld.com. It’s again delivered from the comfort of your desktop, and you can attend all the presentations and mingle the expo booths in your pajamas and slippers, and nobody would care. Or know. Decisions Spring 2011 is an independent conference about Microsoft Dynamics solutions organized by MSDynamicsWorld.com. This live online venue is free to attendees and supported by our sponsors. We build this event upon our leading online news and product information resources to provide a conference experience that provides the latest perspectives on Microsoft Dynamics AX, CRM, GP, and NAV. Decisions Spring 2011 is simply the most focused and effective way to hear about real world Dynamics solutions and case studies and get practical guidance about the latest Microsoft Dynamics trends from the strategic and thought leaders across the Dynamics community. We bring together consultants, analysts, partners, customers, and more for an event that is educational, informational, and collaborative. Again, I was invited to deliver a presentation there, and this time I went for a tricky topic: business to business integration using NAV. My presentation comes with a flashy title “Harnessing the Microsoft Dynamics NAV Technology Stack for Streamlined B2B Process Integration” (a mouthful, I know) and you can read the summary by clicking here. Make sure you don’t miss it, because there is going to be a quite cool demo in the end, showing how to integrate multiple NAV installations on process and transaction level, in two simple real-life scenarios. There are going to be some quite interesting presentations, and four NAV MVPs will be sharing their knowledge and experience with you: Eric Wauters, Jörg Stryk, Rene Gayer, and yours truly. Networking and meeting your peers, partners or potential prospects in the virtual expo room has always been fun and I’m totally looking forward to meeting you there!